A name now hardly on the lips of every supporter, and yet he has the greatest of claims to fame, and he died in what I would call modern times – since I was alive then – December 1965. He was born in 1881 and joined Arsenal in 1903, playing 327 games and scoring 10 goals in 17 years. And he was English – we might not sound so amazing, but if you have been reading other player profiles you will know it was as rare in the early 20th century as it was in the early 21st. 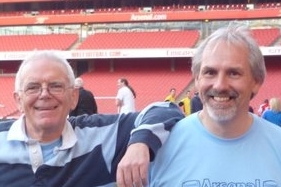 He was a south Londoner, who trained as a teacher (not as uncommon as you might think – the bright athletic boys could often see this as a way not just to earn money from their favourite game, but as a way of securing employment if they got injured, or when they retired). What’s more, since training only took place in the morning he was able to get part time work in the afternoons. I can’t find any details of his subject, but one might suspect PE. In 1903 he came straight into the team, having signed for Woolwich Arsenal from Cheltenham Town, and played in the 3-0 victory over Blackpool on September 5th. This was the promotion season (Arsenal ending second in the second division) and the club started the season with eight straight wins. 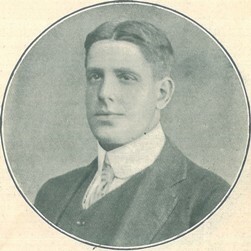 Percy Sands stayed in the team as Woolwich Arsenal moved into the first division although his goalscoring took a bit of a dip: 3 goals in the first season from 32 games in the league, but none from 31 the next season. In the end it was ten goals in 327 games. Incidentally Sands playing record in that first season gives a spot of insight into the way the FA was seen by the club. While he played in 32 out of 34 games in the league he was not selected to play in the first three games in the FA Cup that year, when instead his backup (W Bannister) was given a run out. He did however play in the first (but not the second) of the two cup semi-finals. He played for the Football League representative XI and ultimately became captain – he was in fact the captain in the relegation season of 1912-13, and was the first captain of Arsenal at Highbury – and thus the first captain of The Arsenal. He played 33 games that season including the historic Arsenal v Leicester Fosse on September 6 1913 (we won 2-1). He continued to play around 30 games a season until 1909/1910 when he played regularly until November, but then dropped out of sight – probably with an injury. He was back with 31 appearances the following season. The record of being a near always-present player ended in 1914 with 33 appearances in the 1913-14 season. For the 1914/15 season, which overlapped with the first year of the war he only made 10 appearances, some being at right back, which suggested that he was filling in, or engaged as a teacher elsewhere. (Conscription had not started then). Through the war he still played for Woolwich Arsenal in the unofficial wartime matches put on to keep up public morale, as well as serving with the medical corps on the front. After the cessation of hostilities he joined Southend who were then in the southern league. He died in December 1965 aged 84. There is a picture of the team with Sands in on Arsenal pics. Percy Sands was primarily a woodwork teacher, in fact my brother still has his woodworking tools. As you might suspect, he took games and possibly PE. He went to Cheltenham teachers training college, and turned out for Cheltenham whilst there before returning to South London. As regards his one cap for representing the football league I think the cap that he gave me which is still in pristine condition confirms the date as 1903/4.